A black and white large format negative of a car that has been in an accident. There are three people with their backs to the car and one person can be seen walking beside the car. This negative was part of a collection of negatives found in the Archives storage room. Actual date of negative and photographer are unknown. This negative has started to degrade. 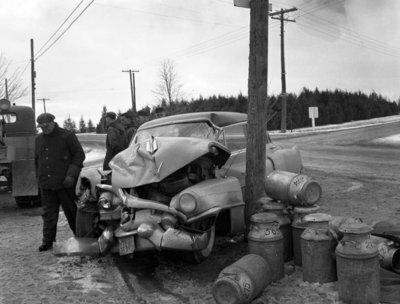 Car Accident, c.1950, Photographer Unknown. Whitby Archives A2013_034_006.